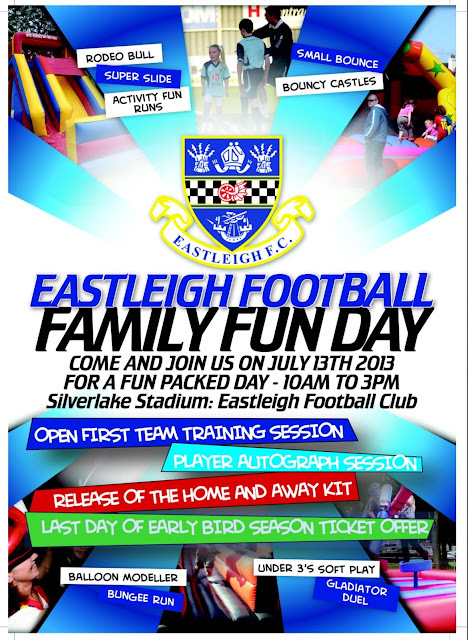 Eastleigh Football Club are very pleased to announce this years Family Fun Day will be held at the Silverlake Stadium on Saturday 13th of July. With doors opening at 10am there is something for everybody to enjoy, the kids will be more than entertained with bouncy castles, a super slide, activity fun runs, bungee run and balloon modelling. The gladiator duel and rodeo bull are sure to attract kids and adults alike, and for those younger children there is an under 3′s soft play area and small bounce. At 11am the First Team will hold an open training session, and for some fans the first chance to see Richard Hill’s summer signings, at the end of the session there will be the opportunity for fans to meet the players during an autograph session. Fans that have purchased their season tickets and/or new replica shirts will be able to collect them, and those looking to purchase a season ticket will still be able to so at the early bird rate. Eastleigh FC have today confirmed the signing of striker Sam Wilson. Sam returns to the club after a season away and will be familiar to the Eastleigh fans having broken through the ranks and into the first team in the 2011/12 season. Richard Hill commented: "I kept an eye on Sam’s progress last season and both myself and the coaching staff have been to watch him with a view to re-signing him for this season. "He is obviously young and relatively inexperienced but he has all the attributes that he needs to become a full time professional footballer. "I think it is vital for the club to try and attract the best young talent in the area. We have done that with Sam and I feel that training with the likes of Strevens, McCallister, Southam etc. will only improve him and make him a better player." Hill continued: "Sam has a great attitude and if he gets his head down, listens and works hard I am confident he can be a real asset to the club. Eastleigh FC are delighted to announce the signing of Ben Strevens following his departure from Dagenham and Redbridge at the end of last season. Ben arrives at the Silverlake bringing with him a wealth of Football League and Conference National experience. Strevens began his career at Wingate & Finchley and in the 1998–99 season in the Isthmian League Division Three he scored 28 league goals coming joint second in the top scorers chart, helping the side to promotion. He was then signed by Barnet. He was then loaned out to Slough Town and then to St Albans City, before becoming a regular first team player for The Bees. 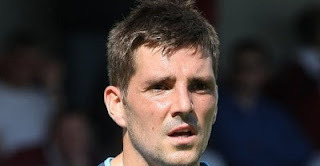 He made 41 appearances in 2005–06 season for the Football League side, by which point he was their longest serving player, but left the club at the end of the season, having scored 42 career goals for the club. Following the recent acquisition of the ground we have been in dialogue with the council to discuss the possibility of enhancing the stadium and facilities at the Silverlake. Unfortunately, but understandably the club will need to seek planning approval to carry out most of the developments we desire. The council have been extremely helpful and are keen to assist us with our plans. With this in mind the council visited us last week to go through and discuss the next steps. We are now in the process of submitting our plans and requesting the relevant planning permission as we look to enhance and improve the ground. We are not envisaging a huge delay in being able to commence work on the stadium. It is well documented that as a club we have a desire to achieve Conference National status. Therefore it is essential that we upgrade the ground to meet the requirements that this demands whilst improving the matchday experience. With the seasons for all different levels of the game commencing on different dates this coming 2013/14 season, arranging pre-season fixtures has proved more of a challenge than usual. Eastleigh report back to training on Monday 1st July for their build up to the Football Conference Southern Division campaign. The first fixture on their schedule is the following Tuesday the 9th July when Npower League Two side Wycombe Wanderers visit the Silverlake Stadium for the first ever meeting between the two clubs. 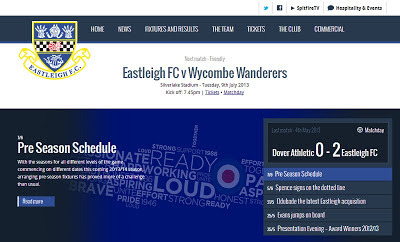 It’s an early start for The Spitfires but the visitors that day start their league campaign on 3rd August a full fortnight ahead of the Football Conference South. Eastleigh FC will have the benefit of a fully fit Dan Spence returning to the side for the start of the 2013/14 season. Spence signed originally on a non-contract basis from fellow Football Conference Southern Division side Hayes & Yeading United in February 2013. Dan had his season cruelly cut short when damaging his shoulder ligaments in only his fourth appearance for the Club at home to Havant & Waterlooville at the end of that month. Manager Richard Hill was delighted when he signed Spence originally from Hayes & Yeading. Dan is a versatile full back having also had spells with Woking, Mansfield, Jerez Industrial (Spain), Salisbury City and Reading. With Spence signing a one-year contract with Eastleigh FC, Hill quipped: "Not heaping any pressure on Dan, but I rate him very highly and he's another player that I tried to sign last November but he chose to stay at Hayes & Yeading.